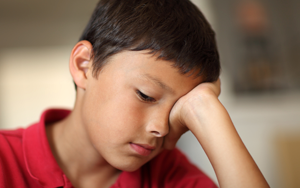 According to the American Academy of Child and Adolescent Psychiatry about 5% of children and teens suffer from depression serious enough to interfere with normal functioning. And, not surprisingly, children with learning disabilities have higher rates of depression than their non-LD peers. Validate feelings. Listen when he becomes frustrated, validate his feelings and praise his efforts, saying, “I’m glad you can tell me how you feel, and I’m sorry, but I know we can help.” It also helps to put a time limit on his pain, reassuring him this won’t last forever. Work with the school. Talk to his teacher to determine the level of school pressure; try to work out a more manageable schedule. Provide healthy outlets. Consider offering more sports, art, acting, and exercise. Help him discover his own interests and nurture his passion. Seek Professional Advice. If symptoms continue for more than a couple of weeks, ask your pediatrician, school counselor, or school psychologist to recommend a professional therapist with whom you can talk about your concerns.